Explore the Humps, a massive granite rock formation in Hyden (photo: Elise Hassey). 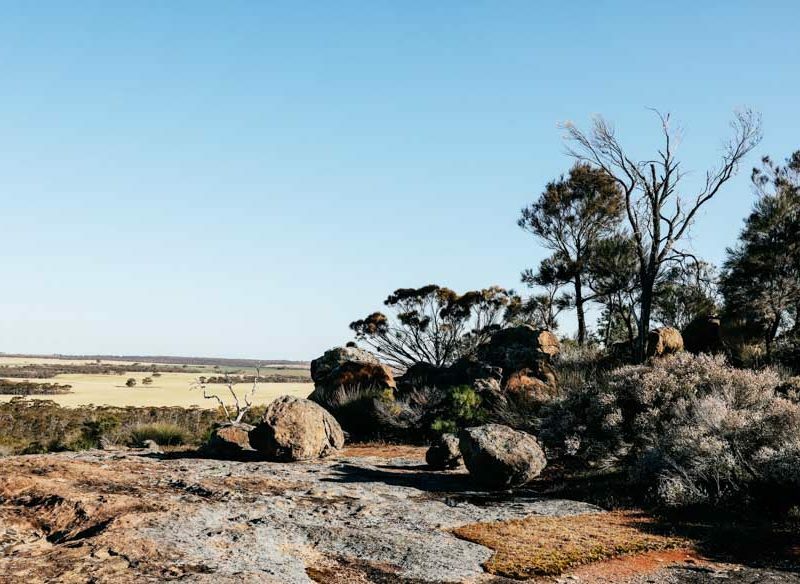 On a road trip through the Golden Outback, explore Mulka’s Cave, Wave Rock and the Humps. Uncover the history of Hyden and York; towns that have managed to etch themselves into WA’s landscape. Forget a journey from A to B; it’s far more relaxing to make stops (especially the unplanned ones) along the way. York is the oldest inland town in Western Australia, and has retained a lot of its original streetscape. There’s an old-fashioned sweet shop, a few eclectic cafes and a motor museum. It’s on the road from York to Quairading that I have my aforementioned ‘aha!’ road trip moment. The landscape drastically changes from patchwork farmland to a shock of ghostly salt lakes dotted with grey, leafless trees. We pull over for a closer look and – as we later find out – the trees are dead due to the rising water table, a result of the mass clearing for agriculture over the last 50 years. Still reeling from the stark beauty of the landscape, we almost fly past a little black and white sign directing us to a section of fence formerly known as The Rabbit Proof Fence. We’ve heard of the movie, but it’s a slice of Australian history we don’t know much about. On completion in 1907 it stretched for 3236.8 kilometres and was the longest fence in the world. It’s mind-boggling to imagine an attempt to stop a plague of rabbits by erecting not one but three fences, and all because of the introduction of 24 rabbits in 1859. We follow the Tin Horse Highway towards Hyden and argue about whether the horse-themed steel sculptures dotting the roadside are the work of one artist, or individual creations by each landowner (it turns out it’s the latter). Regardless, it’s a fun distraction to get us to our resting spot for the night. “I think you need something a bit tough to make your life worthwhile,’’ says Sheenagh Collins; a third-generation Hyden local, general manager of Wave Rock Motel, owner of Wave Rock Resort and impromptu tour guide. We’re lying on the tray of her ute, gazing at the billions of stars and imagining life in 1924 when Sheenagh’s grandfather, Mick Mouritz, was among the first to settle in the area. Lured from Ireland with the promise of a two-storey house and rich, productive farmland, he arrived to uncleared scrubland and nowhere to live. “He and my grandmother lived in a mud hut for 15 years before they could afford to build a proper house, but they were genuinely happy. They had goals and they worked hard to achieve them,’’ she says. Hyden, like many towns in the Southern Wheatbelt, doesn’t have much more than a fire station, supermarket and town hall, but its locals are fiercely proud of their town and seem genuinely happy. With more than 140,000 visitors a year, Wave Rock is the area’s main tourist attraction, but it’s at the Humps 16 kilometres down the road that we feel most in awe. Having escaped the buzzy tour buses, we find an immediate sense of isolation. A neat grid of ghostly gum trees sits adjacent to a narrow dirt path that leads to Mulka’s Cave, inside which are aboriginal hand stencils believed to represent women and children. According to Noongar legend, the cave was the hiding place for an evil cannibal, Mulka, who was later killed by tribe members. It’s as we’re digesting this information that we wander on past the cave, squeezing between two rocks to an immediate landscape change – there’s an entire valley made of granite. We hike along the ridge, eventually realising we’ve discovered the Humps. Moss and lichen stain the rocks, little clusters of pebbles dot the gently undulating rock face and there’s a whisper to the wind. We reach the summit and view green crops as far as the eye can see. The human impact is apparent, yet it’s as if we’re the first ones there.